“Woodrow Wilson: A Biography” by August Heckscher was published in 1991 and is considered one of the best single-volume biographies of Wilson. During World War II he served in the Office of Strategic Services and later became the chief editorial writer at the New York Herald Tribune. He was special consultant on the arts to the Kennedy Administration and Parks Commissioner under New York City Mayor John Lindsay. Heckscher served as president of the Woodrow Wilson Foundation and was a member of the committee which oversaw publication of the Wilson papers. He is also the author of “When LaGuardia Was Mayor: New York’s Legendary Years” and “Alive in the City: Memoir of an ex-Commissioner.” Heckscher died in 1997 at the age of 83. Clearly the product of significant research, “Woodrow Wilson” is lengthy (with 675 pages), comprehensive and detailed. There are few, if any, surprising revelations about Wilson’s presidency or his politics, and Heckscher’s overall evaluation of Wilson does not differ meaningfully from that of most other biographers. What sets this biography apart from others is that while it provides thorough but familiar coverage of Wilson’s presidency, it offers an extraordinarily penetrating analysis of his character and personality. Where many biographers convey a cold and rigid Wilson, Heckscher portrays him as a complex, multifaceted man with wonderful gifts and keen instincts – but also baffling (and occasionally self-destructive) tendencies. The author’s writing style is natural and smooth, exuding a sophisticated elegance which makes this an easy biography to read and to enjoy. He is also adept at introducing new people into the story – dissecting and animating them in an interesting and revealing manner. And unlike some biographies which focus exclusively on the main character, Heckscher ensures that Wilson’s close family and colleagues are thoroughly described as well. The author demonstrates a remarkable degree of insight into Wilson’s time as Princeton’s president, diving into the surprisingly fractious world of campus politics as if he had been there himself. He also provides one of the best discussions of the build-up to World War I (and America’s reluctant involvement) that I’ve seen. But the book’s most poignant moments come at the end as Heckscher examines the last years of the ailing former president’s life. For the most part Heckscher proves objective and well balanced. But he does gloss over or excuse some of Wilson’s shortcomings, such as his attitude toward (and his administration’s treatment of) blacks. And while highlighting many of Wilson’s flaws, the author rarely attempts to analyze Wilson from the point of view of his political adversaries. Instead, Wilson invariably appears noble and idealistic while his enemies are generally portrayed as narrow-minded, mean-spirited and indiscriminately partisan. The first half of the biography (through the mid-point of Wilson’s first term as president) is as good as any presidential biography I’ve read – remarkable given how difficult it can be to vividly reveal someone who seems cold, distant and aloof. But the book’s second half, while extremely informative, becomes somewhat cumbersome during the discussion of World War I and the ensuing peace negotiations. Overall, however, August Heckscher’s “Woodrow Wilson” is an excellent biography; it is comprehensive, engaging and extremely perceptive. 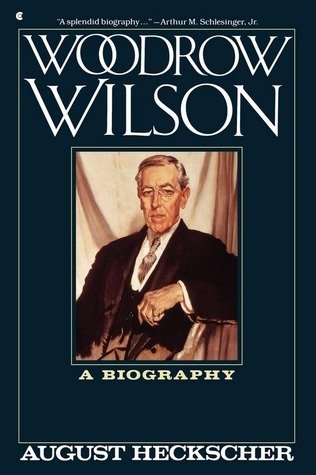 The author makes a convincing, if imperfect, case for Wilson as a great statesman and high-minded idealist burdened by petty and unfortunate flaws. For either a casual reader or an academic audience, August Heckscher’s biography of Woodrow Wilson should prove quite rewarding.